Buy 1 oz A-Mark Liberty Silver Rounds | ?? 1盎司A-Mark自由银圆 In 1983, A-Mark Precious Metals, Inc. began minting The Liberty Pure Silver medallion or round. The Liberty met almost instant success with the demand often outstripping the supply. The obverse design features America's national symbol, The American Eagle with arrows in its talons and surrounded by thirteen stars representing the original thirteen colonies. The reverse depicts the historic Liberty Bell and the words, "Life, Liberty, Happiness" above the bell and the A-Mark logo with 999 Pure Silver below. 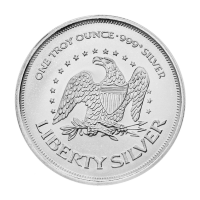 A-Mark Liberty Pure Silver Rounds are an excellent way to invest in pure silver because their premium above the silver spot price is often less than that of legal tender coins. In multiples of 20 these coins will be shipped in a plastic tube.